Corporate governance failures are all too frequent and their patterns and outcomes seem avoidably familiar. This book examines the findings of behavioural finance and economics that are most relevant to governance problems, and suggests potential solutions that are best suited to real-world practice and circumstance. There is a great deal of existing theory that claims to predict the causes and effects of poor governance, and provide solutions. However, the implementation of such measures seems to do little more than merely delay inevitable crises. This book develops a synthesis framework to examine the relative strengths and weaknesses of a behavioural versus deductive approach to understanding the failures of governance. It concludes with a discussion of how corporate governance theory may need to shift going forward, perhaps to include a ‘heterodox’ ecosystem of theoretical paradigms. 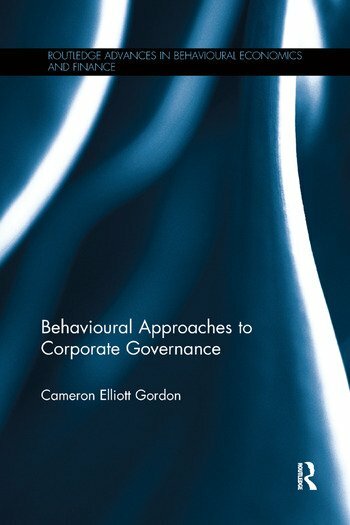 This book will be of interest to students, researchers and practitioners concerned with corporate governance, economic theory and behavioural economics. Cameron Elliott Gordon is Adjunct Associate Professor, Health Research Institute, University of Canberra, Australia.